The Alai Darwaza that translates to 'Alai Gate' was named after the first Khalji Sultan named Ala-ud-din Khalji (Khilji) of the Khalji dynasty in 1311 AD. It lies towards the southern end of the ancient Quwwat-Ul-Islam Masjid within the Qutb Complex in South Delhi. The Alai Gate was constructed with a dome shaped gate made of red sandstone and decorated with stunning Turkic features made of white marble inlay and inscriptions engraved in the ancient Naskh Script and screens made with Lattice stones depicting unique Turkic craftsmanship. This is probably the first Turkic Gate seen with typical Islamic architecture, styles and ornate designs opposed to other buildings seen here that were built before the Turkic rule that employed false domes and arches which is very typical of the architecture seen during the rule of Qutb-ud-din Aibak, the founder of the Slave Dynasty. The Alai Darwaza is also known as the first monument that reveals the true and real Islamic imprints and hence is historically, one of the most significant buildings made during the Delhi Sultanate era seen with domes, pointed arches and beautiful carvings that adds a royal charm to the nearby mosque and complex. 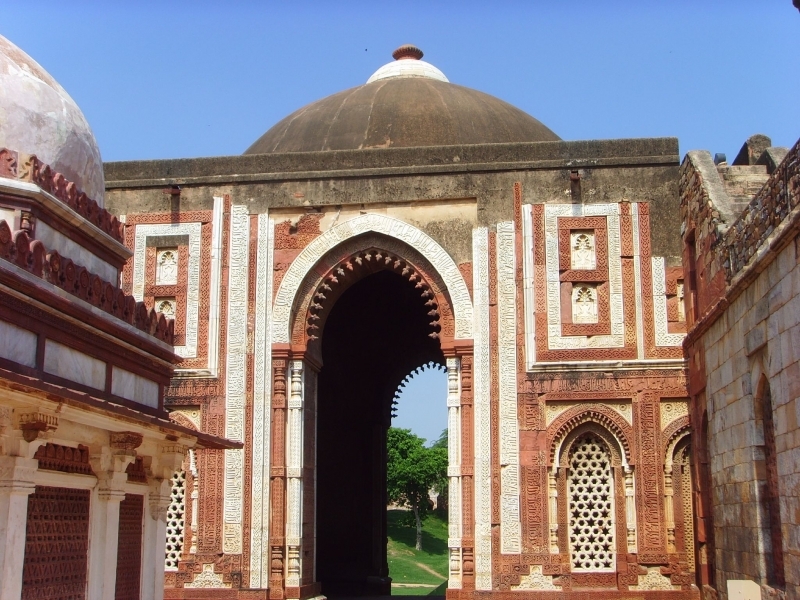 The northern arch of the Alai Darwaza is seen built in a semi circular shape, however, the other arches has the typical horseshoe Islamic design. The side windows are also seen ornate with embellishment of lotus buds and geometric patterns inlaid with red stone and white marble that makes this Gate as one of the most pleasing structures and a treasured Islamic masterpiece of the Turkic era that still exists within the crowded streets and a modern century like ours. Been to Ala-i-Darwaza ? Share your experiences!